The corn puree in this recipe is made with KNORR Concentrated Liquid Stock to help add rich flavour to it. It goes perfectly with salmon. Lightly cook onion in oil in a large pan for 2-3 minutes or until soft. Add corn and water, and cook for 10 minutes. Add cream, KNORR Concentrated Liquid Stock and KNORR Ginger Puree, cook for another 3 minutes. Remove from heat, cool slightly and puree in a blender until smooth. Pass through a sieve to remove any skin or lumps. Drizzle oil over salmon and bake for 15 minutes at 160 degree Celsius. 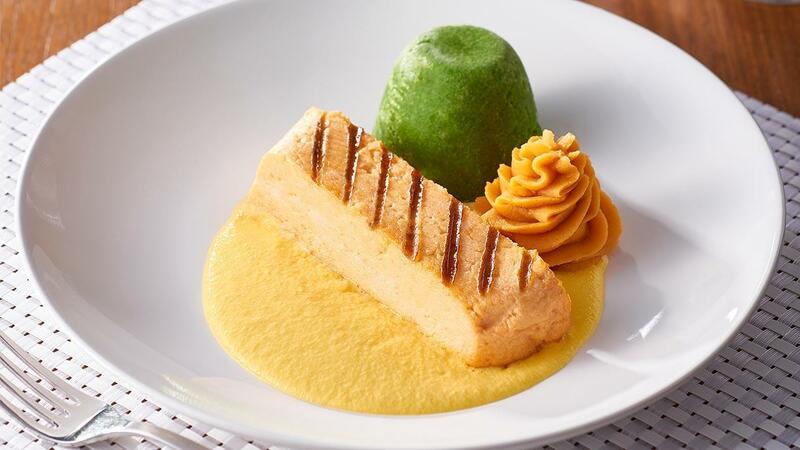 Puree salmon in a blender with KNORR Garde d'Or Hollandaise Sauce until smooth. Place into moulds or shallow long tray and freeze for 24 hours. Heat fish portions and the corn puree. Serve by placing fish on top of the corn puree. Serve with pureed and shaped broccoli and KNORR Instant Sweet Potato Mash.